Peripheral cytopenia is defined as reduction in either of the cellular elements of blood, i.e., red cells, white cells or platelets. Bicytopenia is reduction in any of the two cell lines and pancytopenia is reduction in all the three. There is considerable overlap between the causes and diagnostic approach of bicytopenia and pancytopenia. The etiology of bicytopenia and pancytopenia varies widely in children, ranging from transient marrow viral suppression to marrow infiltration by life-threatening malignancy. These may also be caused iatrogenically, secondary to certain drugs, chemotherapy or radiotherapy for malignancies. 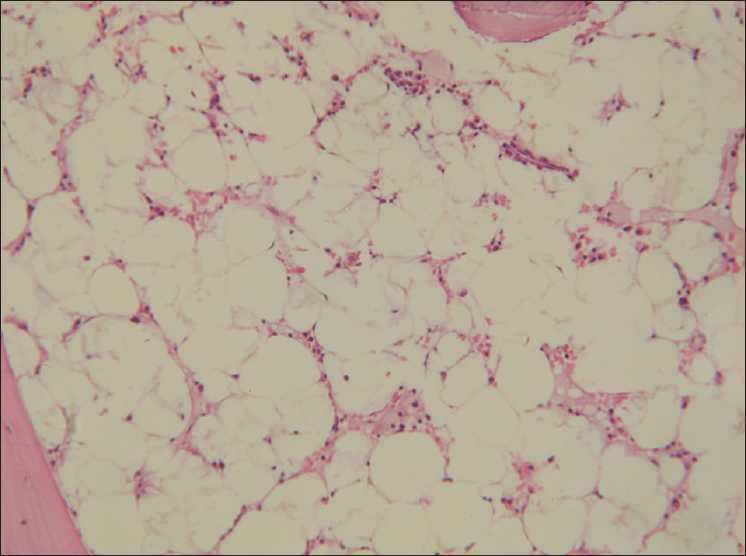 The bone marrow picture may vary depending on the etiology, from normocellular with non-specific changes to hypercellular being replaced completely by malignant cells. According to etiology, degree and duration of the impairment, clinically these can lead to fever, pallor, infection, or serious illness and death. Knowing the exact etiology is important for specific treatment and prognostication. Few studies have analyzed adult patients with pancytopenia. ,, There is scarcity of such data on pediatric patients, and to the best of our knowledge, no study has analyzed adult or pediatric bicytopenic patients. The aim of this study was to evaluate the clinico-hematological profile of children with bicytopenia/pancytopenia. 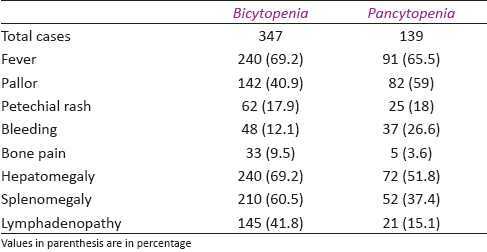 An analysis of bicytopenic/pancytopenic children seen at our tertiary care hospital in North India over a period of 2 years in relation to their clinico-hematological features and specific pathology is presented herewith. Records of children less than 12 years of age, registered at advanced pediatric center and referred for bone marrow examination to department of hematology from January 2007 to December 2008, were retrieved and analyzed. A systematic review of causes, clinical and bone marrow findings was done. Detailed history, clinical examination and hematological parameters at presentation were recorded. Hematological profile included hemoglobin, red cell indices, total and differential leukocyte counts, platelet count, peripheral blood smear morphology and bone marrow aspiration/biopsy. Blood counts were done on automated hematology analyzer (Beckman coulter-LH-750). Platelet counts obtained from counter were confirmed by peripheral blood smear examination. Cytopenia was defined as: hemoglobin < 10 g/dL, total leukocyte count < 4 × 10 9 /L and platelet count < 100 × 10 9 /L. Bone marrow aspiration and trephine biopsy were carried out as per the clinical indication. The bone marrow procedure and further staining was carried out by standard methods. ,, All the bone marrow aspirate smears and trephine biopsies were stained with May-Grunwald Giemsa and hematoxylin and eosin, respectively. Special staining for myeloperoxidase, Sudan black B, periodic acid Schiff and Perl's stain on aspirate smears and reticulin stain on biopsy was done, when indicated. Chi-square test was used for statistical analysis. A P value of <0.01 was taken as statistically significant. During the study period, a total of 990 children were referred to the department of hematology from advanced pediatric center for bone marrow examination for different indications. Of these, 946 underwent bone marrow examination; in 44 cases, bone marrow examination was not carried out as their peripheral blood had increased total leukocyte count and high blast percentage, the final diagnosis could be made based on morphology, cytochemistry and immunophenotyping from the peripheral blood. In 919 patients, both aspiration and trephine biopsy were performed; 27 cases in which biopsy was not performed and only aspiration was done included very young children, leukemia patients on therapy or patients suspected to have megaloblastic anemia. Of the 990 children, 571 (57.7%) had either bicytopenia 396 (40%) or pancytopenia 175 (17.7%), with male:female ratio being 2.9:1. There were a total of 396 children, with male:female ratio of 2.8:1; 64 cases were classified as non-malignant, 241 as malignant, 42 as non-specific and 49 secondary to therapy. Therapy inducing bicytopenia was chemotherapy for acute leukemia in all the 49 cases; these children were excluded and final analysis of etiological spectrum and clinico-hematological profile was done on the remaining 347 children. Most common non-malignant conditions causing bicytopenia were idiopathic thrombocytopenic purpura (ITP) (5.2%), megaloblastic anemia (3.7%), marrow hypocellularity (2.9%) and visceral leishmaniasis (2.0%). Commonest malignant condition which was associated with bicytopenia was acute leukemia (66.9%). Of the acute leukemias, acute lymphoblastic leukemia [Figure 1] was more common, acute myeloid leukemia (AML) was seen in 41 cases of which 8 were AML-M1 , 16 were AML-M2, 5 were AML-M2 with eosinophilia, 5 were AML-M4, 3 were AML-M5, 2 were AML-M6, 1 was AML-M7 and 1 was with AML-M3. In 42 cases, bone marrow did not show a primary bone marrow pathology and these were categorized into non-specific group. Bone marrow examination showed a normocellular marrow in 34 children and was hypercellular in 8. Of these, 26 children showed no specific changes in bone marrow; 10 showed erythroid hyperplasia with rest of the marrow elements being normal; 3 children had features of mild dyserythropoiesis (2 with erythroid hyperplasia and 1 with preserved myeloid:erythroid ratio); 1 child had decrease in megakaryocytic series of cells in a normocellular marrow and 2 children had mild excess of lymphoid cells with other elements being normal. There were 175 children with pancytopenia, with male:female ratio of 3.2:1; 78 cases were classified as non-malignant, 37 as malignant, 24 as non-specific and 36 as having iatrogenic/therapy induced pancytopenia. Therapy inducing pancytopenia was also chemotherapy for acute leukemia in all the 36 cases; these children were excluded and final analysis of etiological spectrum and clinico-hematological profile was done on the remaining 139 children. Most common non-malignant condition associated with pancytopenia was aplastic anemia (33.8%) [Figure 2], followed by megaloblastic anemia (13.7%). Malignancy leading to pancytopenia was acute leukemia (26.6%) in all the cases. In the non-specific group, there were 24 children. Bone marrow examination in these children showed a normocellular marrow in 23 and was hypercellular in 1. Of these, 12 children showed no specific changes in bone marrow; 9 children had erythroid hyperplasia (7 with other hematopoietic cells being normal, 1 with decrease in mature granulocytes and 1 with mild increase in lymphocytes and plasma cells); 2 children had relative decrease of megakaryocytes and erythroid cells in a normocellular marrow and 1 child showed focal areas of myxoid degeneration with decrease in megakaryocytic and granulocytic series of cells in a normocellular marrow. [Table 1] summarizes the etiological profile of bicytopenia and pancytopenia seen in children analyzed in this study. [Table 2] summarizes the clinical profile of bicytopenia and pancytopenia in children analyzed in the study. The main presenting features in children with bicytopenia were fever (69.2%) and pallor (40.9%), other common ones being petechial rash, bleeding manifestations and bone pains. Most common physical finding was hepatomegaly (69.2%) and splenomegaly (60.5%). The main presenting features in children with pancytopenia were fever (51.8%) and pallor (59%). Other common symptoms consisted of petechial rash, bleeding and bone pains. On clinical examination, hepatomegaly was seen in 51.8% and splenomegaly in 37.4% cases. Hematologically, thrombocytopenia and anemia was the most common form of bicytopenia, seen in 268 cases (77.5%), followed by anemia and leukopenia in 60 (17.3%) and thrombocytopenia and leukopenia in 19 (5.5%) cases. Peripheral smear showed anisocytosis in almost all cases of bicytopenia and pancytopenia. Hypersegmented polymorphs were seen exclusively in patients with megaloblastic anemia. Circulating blasts were seen in 64.6% cases of bicytopenia and 20.1% cases of pancytopenia. The two groups of bicytopenic and pancytopenic patients showed significant differences in incidence of underlying malignancy, circulating blasts, lymphadenopathy (P < 0.001 for all), splenomegaly (P < 0.005) and bleeding manifestations (P < 0.01). [Table 3] gives the hematological profile of bicytopenia and pancytopenia in children analyzed in the study. There are a limited number of studies in the literature evaluating pancytopenic children, and to the best of our knowledge, no data have been reported on the spectrum of bicytopenia in children. Bicytopenia/pancytopenia is a feature of many transient illnesses or serious life-threatening diseases. The frequency of pattern of diseases causing them varies in different population groups and this has been attributed to differences in methodology and stringency of diagnostic criteria, geographic area, period of observation, genetic differences, nutritional status, prevalence of infections and varying exposure to myelotoxic drugs among others. The published studies on pancytopenia have also been limited by the referral nature of patient population. There are varying reports on the underlying etiology of pancytopenia from various parts of the world. In a study in France by Imbert et al.,  213 consecutive adult pancytopenic patients were reviewed and underlying malignant myeloid disorders were found in 42% of their cases and various malignant lymphoid disorders in 18%, followed by aplastic anemia in 10%. Jha et al. from Nepal studied the causes of pancytopenia in 148 patients. The commonest etiology of pancytopenia in their study was hypoplastic bone marrow seen in 43 cases (29%), followed by megaloblastic anemia in 35 cases (23.6%) and hematological malignancy in 32 cases (21.6%). In children, hypoplastic bone marrow (38.1%) and in adults megaloblastic anemia (30.2%) was the commonest etiology reported by them. A study from Pakistan found megaloblastic anemia as the most prevalent diagnosis and the major cause of bicytopenia and pancytopenia in the bone marrow aspirates performed in their pediatric unit. Another study from Pakistan by Memon et al. on 230 pancytopenic children found the most common causes of pancytopenia as aplastic anemia, megaloblastic anemia, leukemia and infections. The common clinical presentations of pancytopenic children in their study were pallor, fever, petechial hemorrhages, visceromegaly and bleeding from nose and gastrointestinal tract. Studies from India on etiology of pancytopenia are limited and have shown variable causes, depending on the referral population and nutritional status of the study area. Etiological profile of adult pancytopenic patients was studied by Varma et al. and Kumar et al. Tilak et al. and Khunger et al. included children along with adults while doing a clinico-hematological analysis of 77 and 200 pancytopenic patients, respectively; Bhatnagar et al. and Gupta et al. have however evaluated causes of pancytopenia exclusively in children. In adults, aplastic anemia was found to be the most common cause of pancytopenia in reports by Varma et al. (40.6%) and Kumar et al. (29.5%). However, studies by Tilak et al. and Khunger et al. found megaloblastic anemia to be the most important cause of pancytopenia in adults. In children, Bhatnagar et al.,  who retrospectively analyzed 109 pediatric patients presenting with pancytopenia, found megaloblastic anemia as the single most common etiological factor causing pancytopenia in 28.4% children, followed by acute leukemia and infections in 21% patients each, and aplastic anemia in 20% cases. Gupta et al. reviewed 105 children aged 1.5-18 years with pancytopenia. In their study, aplastic anemia was the most common cause of pancytopenia (43%), followed by acute leukemia (25%). Infections were the third most common cause of pancytopenia of which kala-azar was the most common. Megaloblastic anemia was seen in 6.7% children by them. Fever and progressive pallor were the most common presenting complaints in their cohort, being present in 81.4%, followed by bleeding manifestations in 72.9%. 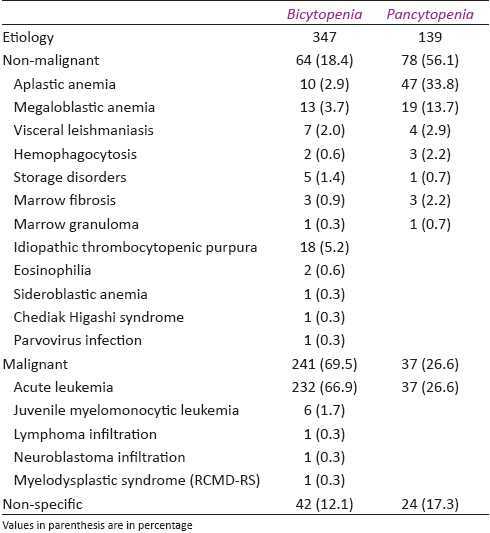 In our study, the most common underlying etiology was aplastic anemia in 47 (33.8%), followed by acute leukemia in 37 (26.6%) pancytopenic children. Megaloblastic anemia was seen in 19 (13.7%) children. The most common clinical presentations were fever (65.5%), pallor (59%) and hepatomegaly (51.8%). Thus, the commonest causes of pancytopenia reported by different studies throughout the world have been aplastic anemia, megaloblastic anemia and leukemia. [Table 4] summarizes the salient findings of various studies on pancytopenia. We also evaluated the underlying etiology in children with bicytopenia, and contrary to the pancytopenia group, the underlying pathology in majority of patients with bicytopenia was a malignancy in 69.5% cases. Most common malignancy was acute leukemia, others being juvenile myelomonocytic leukemia, myelodysplastic syndrome and infiltration by non-Hodgkins lymphoma and neuroblastoma. Of the acute leukemias, lymphoid leukemia was more common; myeloid leukemia was seen in 41 cases, of which FAB group AML-M2 was the most frequent. Most common non-malignant conditions causing bicytopenia were ITP, megaloblastic anemia and marrow hypocellularity. Although the disease ITP per se causes reduction only in platelet count, we came across cases with bicytopenia also involving the hemoglobin levels because of additional nutritional deficiency, which is quite prevalent in this part of the world. Another finding which was observed was that leukemia at presentation had bicytopenia involving the hemoglobin and platelet count, whereas leukemia patients on chemotherapy had bicytopenia involving the hemoglobin and total leukocyte count; this is because at presentation the total leukocyte count is usually in normal limits or elevated because of malignant proliferation of leukemic cells and the erythroid and megakaryocytic lineages are suppressed by leukemia infiltration, whereas while the patient is on chemotherapy, the drugs are targeted toward the leukemic cells and also the platelet counts are being maintained by repeated transfusions during the treatment. We found that the routine hematological parameters were non-specific and showed a significant overlap among the major causes of cytopenias. However, the peripheral blood films were valuable in pointing toward the cause in patients with megaloblastic anemia and leukemia. 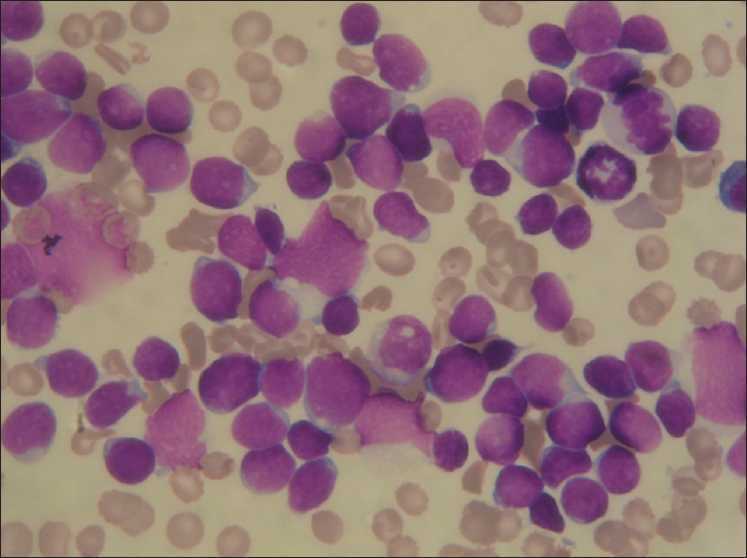 Bone marrow aspirate was found to be sufficient for diagnosis in most cases of leukemia and megaloblastic anemia; however, biopsy was mandatory for the diagnosis of aplastic anemia. In this study, besides the common causes of pancytopenia, i.e., acute leukemia, megaloblastic anemia, aplastic anemia, other causes of pancytopenia, including visceral leishmaniasis, hemophagocytosis, storage disorders, marrow fibrosis, marrow granuloma were also identified. Majority of bicytopenic patients had acute leukemia, and in addition to causes seen in pancytopenic patients, other causes included juvenile myelomonocytic leukemia, lymphoma infiltration, neuroblastoma infiltration, myelodysplastic syndrome (RCMD-RS), eosinophilia, sideroblastic anemia, Chediak Higashi syndrome, parvovirus, ITP. The less common causes of cytopenias should also be kept in mind while reviewing cases with bicytopenia/pancytopenia and the importance of peripheral blood smear examination in cases of bicytopenia cannot be overemphasized. Underlying condition causing bicytopenia in majority of cases was acute lymphoblastic leukemia in our study, timely diagnosis of which is important, as pediatric patients respond well to chemotherapy. To know the underlying etiology is important for a practitioner as it is of assistance in the future evaluation of children with pancytopenia/bicytopenia. This study analyzed the clinico-hematological and etiological profile of bicytopenia and pancytopenia in children. Of the 990 children requiring bone marrow examination, 571 (57.7%) had either bicytopenia (40%) or pancytopenia (17.7%). Findings in these cases included: (i) acute leukemia and aplastic anemia as the most common causes of bicytopenia and pancytopenia, respectively; (ii) incidence of splenomegaly, lymphadenopathy and circulating blasts was higher in children with bicytopenia and bleeding in children with pancytopenia. Although the presence of pancytopenia is taken with greater clinical concern than bicytopenia, we however in our study found bicytopenia to be associated with a malignant condition in 69.5% cases compared to 26.6% cases of pancytopenia. This finding focuses also on the timely evaluation of patients with bicytopenia. The clinical findings and peripheral blood picture provide valuable information in the workup of patients with cytopenias, aid in pointing toward diagnosis in majority of bicytopenic children and help in planning investigations from bone marrow samples, such as immunophenotyping and cytogenetic studies. In addition, an early recognition of the underlying conditions will have an impact on the mortality and morbidity in vulnerable pediatric patients. 1. Bates I, Bain BJ. Approach to diagnosis and classification of blood diseases. In: Lewis SM, Bain BJ, Bates I, editors. Dacie and Lewis Practical Haematology. 10 th ed. Philadelphia: Churchill Livingstone; 2006. p. 609-24. 2. Varma N, Dash S. A reappraisal of underlying pathology in adult patients presenting with pancytopenia. Trop Georg Med 1992;44:322-7. 3. Imbert M, Scoazec JY, Mary JY, Jouzult H, Rochant H, Sultan C. Adult patients presenting with pancytopenia: A reappraisal of underlying pathology and diagnostic procedures in 213 cases. Hematol Pathol 1989;3:159-67. 4. Kumar R, Kabra SP, Kumar H, Anand AC, Madan H. Pancytopenia - a six year study. J Assoc Phys India 2001;49:1078-81. 5. Bain BJ, Lewis SM. Preparation and staining methods for blood and bone marrow films. In: Lewis SM, Bain BJ, Bates I, editors. Dacie and Lewis Practical Haematology. 10 th ed. Philadelphia: Churchill Livingstone; 2006. p. 59-78. 6. Bates I. Bone marrow biopsy. In: Lewis SM, Bain BJ, Bates I, editors. Dacie and Lewis Practical Haematology. 10 th ed. Philadelphia: Churchill Livingstone; 2006. p. 115-30. 7. Swirsky D, Bain BJ. Erythrocyte and leucocyte cytochemistry. In: Lewis SM, Bain BJ, Bates I, editors. Dacie and Lewis Practical Haematology. 10 th ed. Philadelphia: Churchill Livingstone; 2006. p. 311-34. 8. International agranulocytosis and aplastic anemia study. Incidence of aplastic anemia: The relevance of diagnostic criteria. Blood 1987;70:1718-21. 9. Savage DG, Allen RH, Gangaidzo IT, Levy LM, Gwanzura C, Moyo A, et al. Pancytopenia in Zimbabwe. Am J Med Sci 1999;317:22-32. 10. Jha A, Sayami G, Adhikari RC, Panta AD, Jha R. Bone marrow examination in cases of pancytopenia. J Nepal Med Assoc 2008;47:12-7. 11. Ayub T, Khan FR. 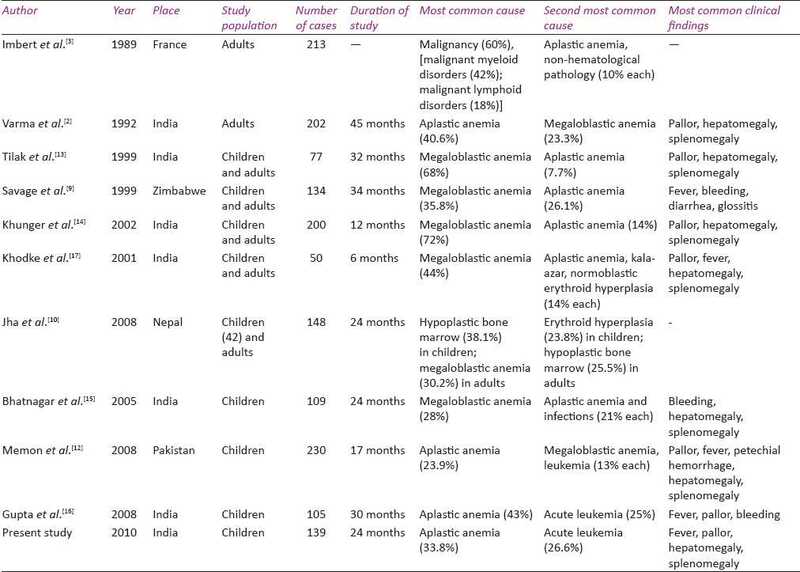 Prevalence of megaloblastic anaemia in a paediatric unit. Gomal J Med Sci 2009;7:62-4. 12. Memon S, Salma S, Nizamani MA. Etiological spectrum of pancytopenia based on bone marrow examination by children. J Coll Physicians Surg Pak 2008;18:163-7. 13. Tilak V, Raini J. Pancytopenia- a clinico-hematological analysis of 77 cases. Indian J Pathol Microbiol 1999;42:399-404. 14. Khunger JM, Arunselvi S, Sharma U, Ranga S, Talib VH. Pancytopenia- a clinico-hematological analysis of 200 cases. Indian J Pathol Microbiol 2002;45:375- 9. 15. Bhatnagar SK, Chandra J, Narayan S, Sharma S, Singh V, Dutta AK. Pancytopenia in children: Etiological profile. J Trop Pediatr 2005;51:236-9. 16. Gupta V, Tripathi S, Tilak V, Bhatia BD. A study of clinico-haematological profiles of pancytopenia in children. Trop Doct 2008;38:241-3. 17. Khodke K, Marwah S, Buxi G, Yadav RB, Chaturvedi NK. Bone marrow examination in cases of pancytopenia. J Indian Acad Clin Med 2001;2:55-9.